A King County Superior Court judge has rejected a bid by a forest landowner to be dismissed as a defendant in lawsuits filed by survivors of the Oso landslide and the families of those who died. Rogoff’s ruling helps set the stage for a trial scheduled for next June as plaintiffs seek damages in the aftermath of the massive landslide that killed 43 people and destroyed dozens of homes on March 22, 2014. The Seattle Times’ complete coverage of the Oso landslide, including investigative stories, profiles of the victims, interactive maps and a photo gallery. The North Cascades are full of unstable terrain, and multiple factors can contribute to a major landslide. The Hazel landslide formation near Oso was a well-documented hazard zone in the Stillaguamish River valley that had unleashed slides over the decades. Plaintiffs’ attorneys have argued that logging over the years contributed to the deep-seated slope failure by allowing more water to seep into the slide zone. 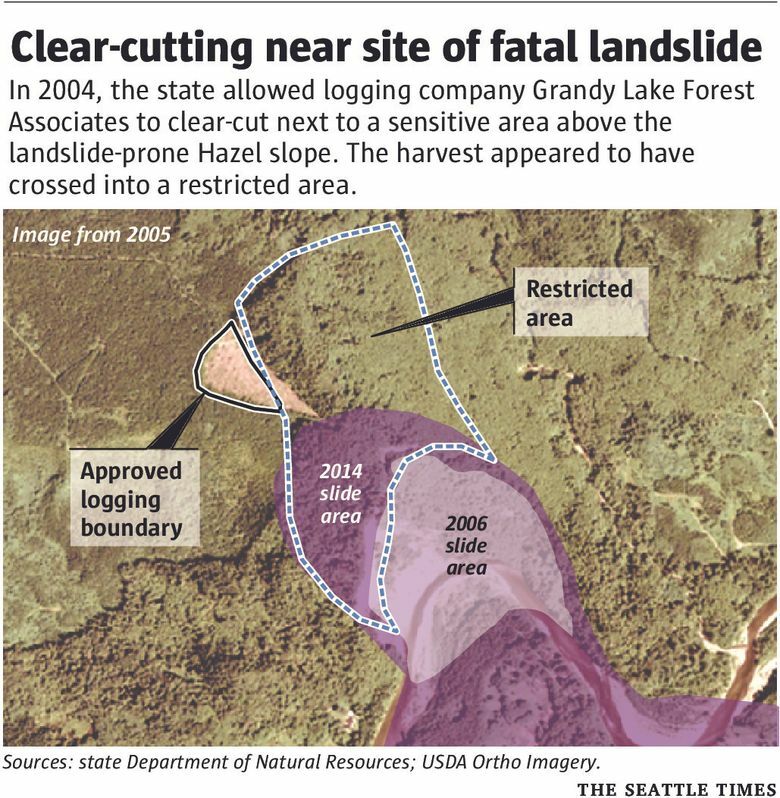 They have contended that Grandy Lake Forest Associates should have monitored the slope following a 7.5-acre clear-cut in 2004 that was located just above the slide formation. Part of the harvest appeared to be in a sensitive water recharge area. In a motion filed earlier this fall, Grandy Lake Forest Associates argued that it followed state Department of Natural Resources prescriptions for logging the area, and thus should be absolved of liability. Rogoff said that Grandy Lake’s arguments could win the day but would have to do so in front of a jury. In his ruling, he found that compliance with rules “does not per se” excuse a defendant from claims of negligence. Monday’s ruling was a boost for the plaintiffs’ attorneys, who in August suffered a setback when Rogoff dismissed legal arguments that the state could be held liable for the mishandling of forest-practices regulations. However, in Monday’s ruling, Rogoff indicated that the State Department of Natural Resources might have liability as a property owner in the landslide zone. In a 2014 complaint filed with the court, a plaintiff’s attorney wrote that a landslide in 2006 — two years after the Grandy Lake logging — increased the instability of the overall landslide formation. Yet no defendant carefully evaluated the changes or installed monitoring equipment to help assess the risk, the brief states.